What is write in U1 component ( reference ) ? 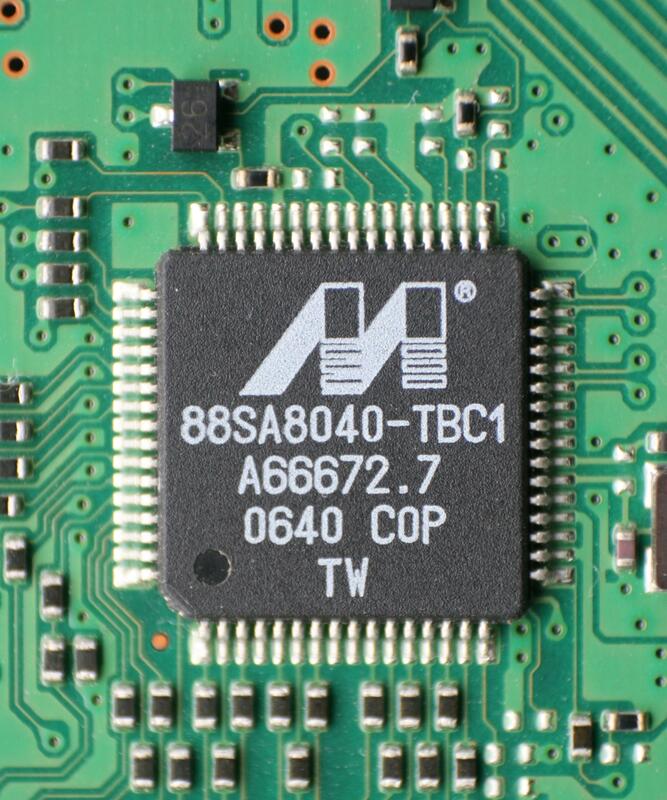 This is LM2678 DC converter National Semiconductors. Author let check F1 and F2. Then Check Power supply on U1 LM2678. U1 would be the +5V supply. This supply would be common to both the IDE and SATA channels. Also, U1 would be the source for the secondary supplies (for the logic). Therefore, I can't see a problem here. F1 - F4 appear to be polyswitches or polyfuses (resettable fuses). I would measure the voltages at those pins that are marked with squares. Can you tell us the markings on Q1? when i opened the box first time i saw 3 capacitor damage. i replace three capacitors , original value was 10v 2200uf,and a replace with 10v 1000uf .but result is same .can it be cause of capacitors . Can you show us the other side of the PCB? Can you also show us both sides of the logic PCB? Hmm, 1000uf is less than half the capacity of 2200uf, which could be the cause for problems, yes. But it's a bit strange that you do not get any power output. Did you make sure that you mounted them in the right direction? Did you make sure that you mounted them in the right direction? The polarity stripes on the caps are consistent with the "+" indicators on the silkscreen. Hmm, 1000uf is less than half the capacity of 2200uf, which could be the cause for problems, yes. I don't think that there is any requirement for capacitors at each of the +5V and +12V outputs. In fact I don't understand their purpose (other tools don't have them). However, the capacitor at the 5V regulator should be a low ESR, 105 degC type. Moreover, the capacitor at the 12V input appears to be a 10V type, so something could be seriously wrong here. hello abdul rauf , i never worked on this PCB but visually what i understand that is same as fzabkar already told you, so i would advice you to follow fzabkar instructions. addition from my side is = did you use new capacitors ? 2nd choose 105 degree caps 2200uF /16V( you can find RUBYCON or UNICON caps in local market easily ) 3rd when you turn on power from software you have to check if SATA control pin is high or low ? you will need to look other side too . 4th its possible connector from its motherboard or main PCB is loose or bad contact. i assume the input power supply is good ( i mean current not Volts ). right ? because you already mentioned IDE port is good . MOSFETs are good too ? I can't see all the markings on the bad capacitor (can you tell us what they are? ), but I'm assuming its a ZLH series Rubycon. If so, then all the caps have good specs, in which case I can only assume that DFL was stung by a bad batch, or maybe even fakes (?). It would be difficult to measure the test points when the unit is assembled. However, the power board can be tested on its own if a jumper wire is added between the +5V supply and the SATA on/off control pin. I also can't see the markings on the N-ch MOSFET (Q1). Can you tell us what they are? BTW, the pushbutton switch looks like it needs replacing. 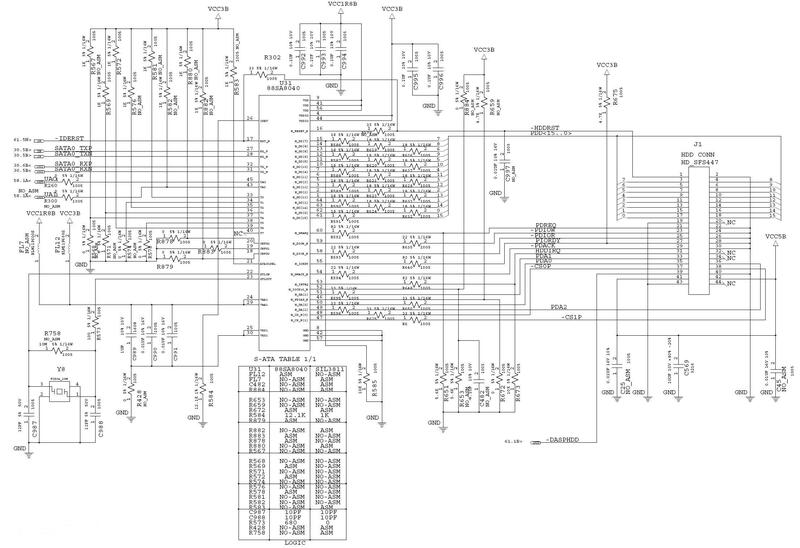 U4 = 8-bit microcontroller ? U7/U8 = LDO regulator or load switch ? Its good idea ..... . he can also add a resistor (limiter) +5 to Gate. 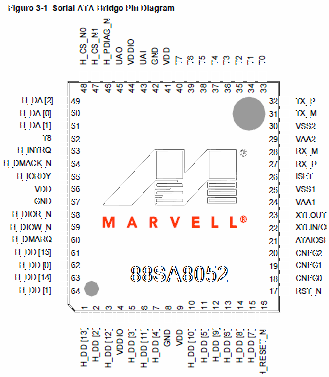 The logic board drives the power board directly, without limiting resistors. ISTM that R5 and R7 are sufficiently large so as to limit the base current into Q3 and Q6.